“When the world is flat, you can innovate without having to emigrate”. But, how did the world `become flat’? 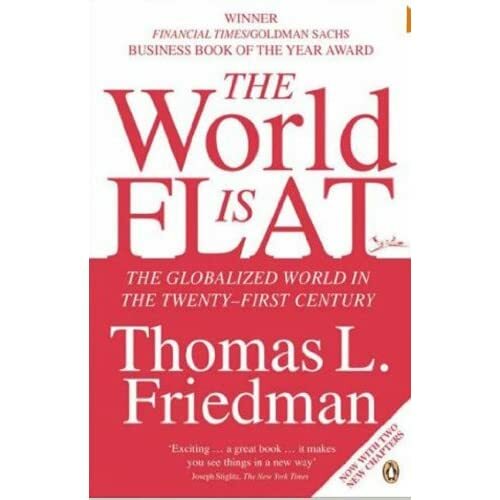 Friedman suggest the trigger events were the collapse of communism, the dot-com bubble resulting in overinvestment in fiber-optic telecommunications, and the subsequent out-sourcing of engineers enlisted to fix the perceived Y2K problem. Those events created an environment where products, services, and labor are cheaper. However, the West is now losing its strong-hold on economic dominance. Depending on if viewed from the eyes of a consumer or a producer – that’s either good or bad, or a combination of both. Compare to the past, it is so much easier for people to connect and meet, therefore ideas can develop into business and free information are available to grab by a simple click. Perhaps that’s one of the major reason why Asians are making more progress these days. Understanding that Chinese and Indians are coming from a much worse position and there is an uncontrollable desire to catch up and having a better life style. While the west is getting lazy because people there already got so much to sit on.